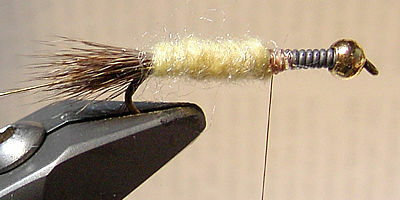 This fly is similar to a Hex nymph tied by an Almanor regular, either Milt Jensen or Dr. Del Heacock. I will find out this year and will correct this recipe to acknowledge the correct person. Their pattern is tied with the hook up instead of down as I have tied mine. 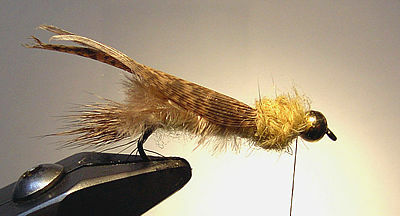 While the original used pheasant tail feathers for the tail, I use short fine deer body hair. 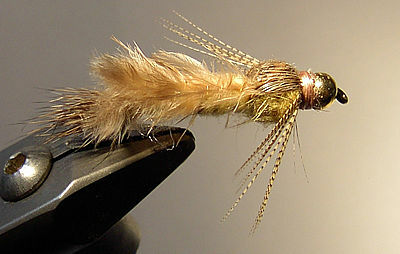 I like the way the fine deer hair flairs so I use it on all my nymph patterns that have a hare's ear color. This short fine hair is found on the legs of the deer. I've also use a yellow synthetic yarn instead of the original yellow chenille for the lower body, simply because I have so much of it. For the over-body marabou on the lower body I use a color as close to a light-brown gray as I could find. 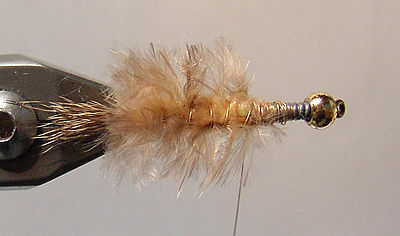 It is made by Hareline Dubbing and goes by the name Grizzly Marabou, Tan. 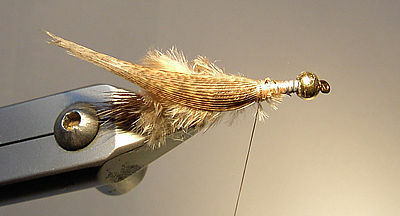 I've also weighted my flies with medium lead wire (12 turns). 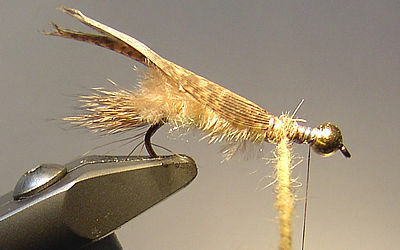 Hex nymphs are perfect to fish with during the early evening before the Hex hatch starts. Some fishermen only use nymphs during the hatch, but my first love is to fish for trout on the surface. Whenever you see me fishing out of a float tube during the hex hatch, you'll almost always find me with two rods. One set up with a floating line and a hex emerger. 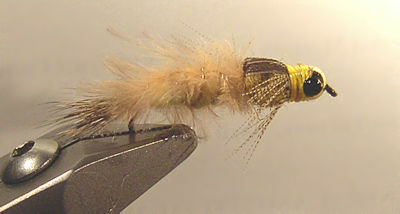 The other will be a sinking line with either my bead head Hare's Ear Nymph or, now, with this Hexagenia nymph. Put bead-head on hook. Sometimes you have to pinch the barb to get it through the hole. 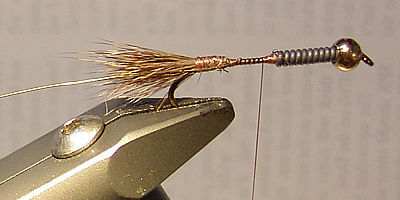 Wrap lead wire onto hook 12 turns and push into back of bead-head. Wrap thread at base of lead to hold it in place. 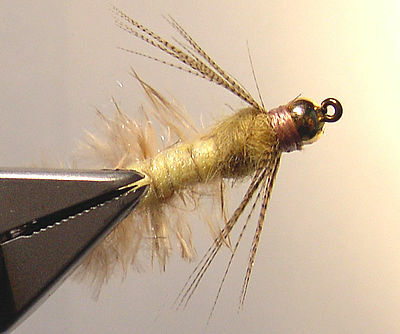 Tie in a small clump of short fine deer body hair for tail. Hold it to top of hook as you wrap so it does not spin around hook. Anchor in a 5"-6" piece of ribbing wire. Tie in and wrap lower body with yellow yarn. Prepare grizzly marabou feather. 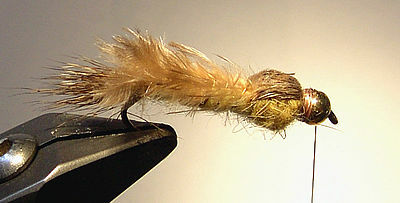 Tie this feather down over the lower body with ribbing wire. Wrap excess wire over wrapped lead. Trim off marabou feather. 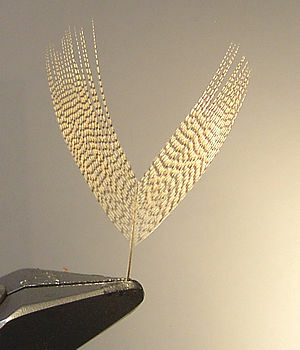 Tie in a 1/4" to 5/16" wide piece of turkey quill, dark brown portion. Make a dubbing loop of thorax dubbing. Dub thorax. 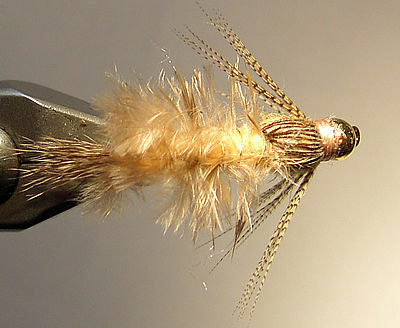 Fold over turkey quill for wing case, tie down and trim. Prepare wood-duck flank feather for legs. 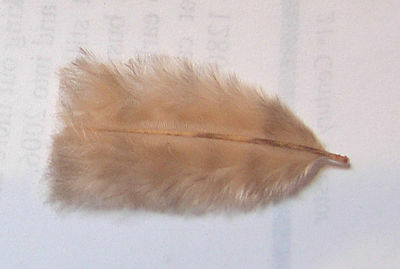 Tie in prepared feather for legs. Before trimming pull legs down into proper position. Now trim and whip finish fly. Used head cement on wraps and top of thorax case. Use tooth pick to dab on Tester black enamel paint for eyes on the bead-head to finish the fly. That's all until Almanor. Tight lines!